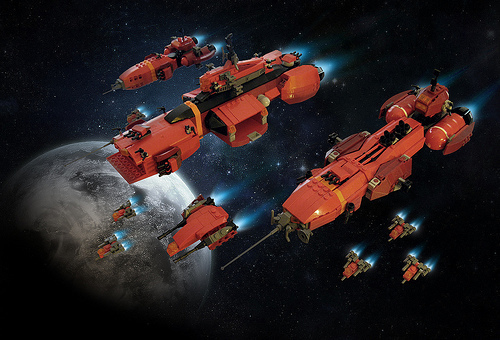 I alluded to the opposing force that inspired my own microscale battle fleet, but it looks like I didn’t end up blogging Mike Yoder‘s fleet on its own. Well, this wonderful new poster created for Mike by Stijn gives me a great excuse to do so. All of Mike’s ships have a consistent design that visually places them within the same faction, while each vessel has a unique style of its own. I just love the little fighters!